This is a wonderful full coverage foundation for day because its not too thick and it has sunscreen in it for the day. With this foundation no primer or concealer (except under the eyes) is needed, which will save you time getting ready in the morning. I have oily skin and this foundation still works for me. I love applying it with my beauty blender. This is a full coverage foundation, even more so than the liquid Revlon ColorStay version. It is suitable for all skin types and goes on creamy and smooth. I personally like it more so for when it's cooler outside but it's still a great foundation for drugstore especially for dry skin. It applies best with a makeup brush (I like use any Sigma Kabuki) than a sponge. I like this concealer for day because it already has your SPF in it so you can skip your eye cream in the morning. However, if you don't like the smell of sunscreen I don't recommend it kind of has a strong fragrance. I wouldn't say this concealer instantly rewinds your age, however, it is a good concealer that covers well that's not cakey. I have oily skin and I like to use medium- full coverage foundation so this powder is great and is super cheap. 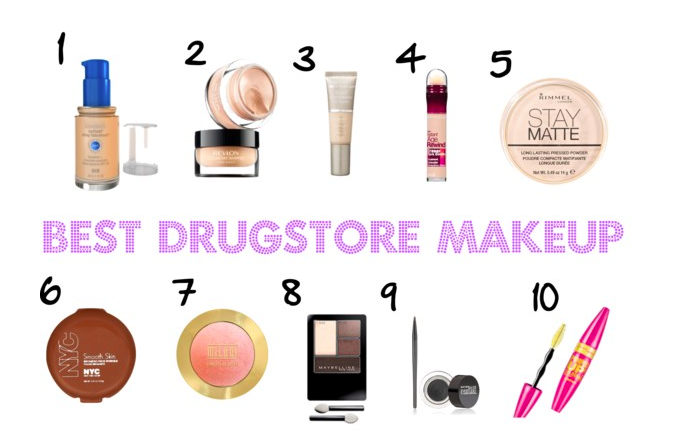 It's hard to find pigmented not too organgey or red bronzers at the drugstore. This is a matte bronzer that is perfect to bronze the whole face. These blushes remind me so much of MAC Mineralize blushes. They are baked and have a slight natural shimmer just like the MAC ones do. All of there colors are beautiful. They aren't as blendable as the other high end blushes I have like NARS (obviously) but its not chalky like a lot of drugstore ones commonly are. These eye shadows are great all around for the drugstore because there a lot of colors to choose from, it will gives you all the colors you need for a completed eye, and instructions on where to strategically place them. This eyeliner is great because it's super long lasting, doesn't smear, goes on smoothly, and it jet black. It's best to apply this with an angled eye liner brush versus the one it gives you with the product. I just tried this new mascara recently and I really like it because it gives my lashes natural volume and length while not clumping at all. Perfect for every day. It's a pretty wet formula when you first get it but after the first couple uses its great.